James Brohan was born in 1952 in Dublin. He attended Blackrock Vocational School. In 1973 he qualified as a motor mechanic and spent fifteen years in this trade. 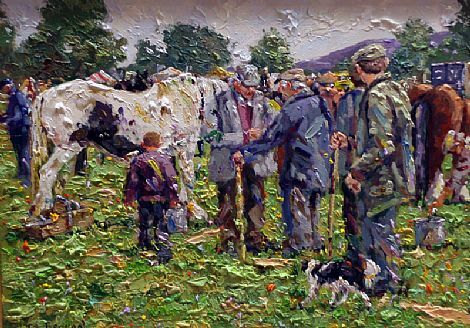 On moving to north Wicklow in 1976 Brohan began to paint. Brohan studied painting and anatomy, under Yann Gaoulet RHA, which taught him to ‘look and observe’ and Liam Treacy, who taught him to use colour in a loose impressionistic way. He continued his studies at Dun Laoghaire College of Art and Design and later at the National College of Art and Design as a pupil of Desmond Carrick RHA. His inspiration comes directly from Ireland and he is heavily influenced by the work of Irish impressionists. 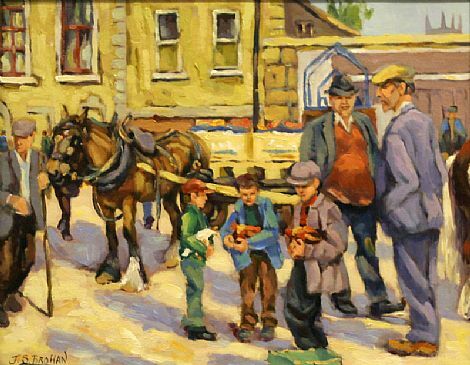 Brohan’s paintings are about colour rather than tone and the essence of capturing the subtle nuances of light. Due to the increasing modernisation of and an ever-changing Ireland his aim is to record the times he lives in. Brohan’s paintings are easily recognised by the rich and vibrant colour that he uses in a loose impasto fashion. Applied with a brush, his work reflects the mood, colour and light that inspire him to paint a wide range of subjects such as boats, harbours, farm animals and still life. In his figurative scenes he aims to capture a moment, a movement but most of all an emotion. Brohan has exhibited in many major galleries in Ireland and overseas. His work hangs in private collections in the USA, Ireland and mainland Europe.